If you purchase from BabyVision seller and experience any quality problems, please contact BabyVision through your Amazon account. 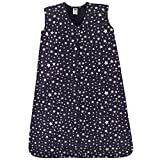 Interested in the Hudson Baby Wearable Safe Soft Jersey Cotton Sleeping Bag, Midnight Stars, 12-18 Months? Is the price too high? You can easily price watch this product and we'll notify you when the price reaches your target.